All venues for Async 2008 and NoCS 2008 are on the main Newcastle University campus. Monday 7th April 8.30-9.00 near L101 Merz Court. Monday 7th April 18.00-19.00 Courtyard foyer (shown as the Old Library Building). Tuesday 8th April 8.00-8.45 Herschel Building foyer. We will make sure there are plenty of visible signs to direct you on the day! Tutorials (Monday 7th April) will be held in Merz Court. The Welcome Reception (Monday 7th April) will be held in the Courtyard (shown as the Old Library Building). 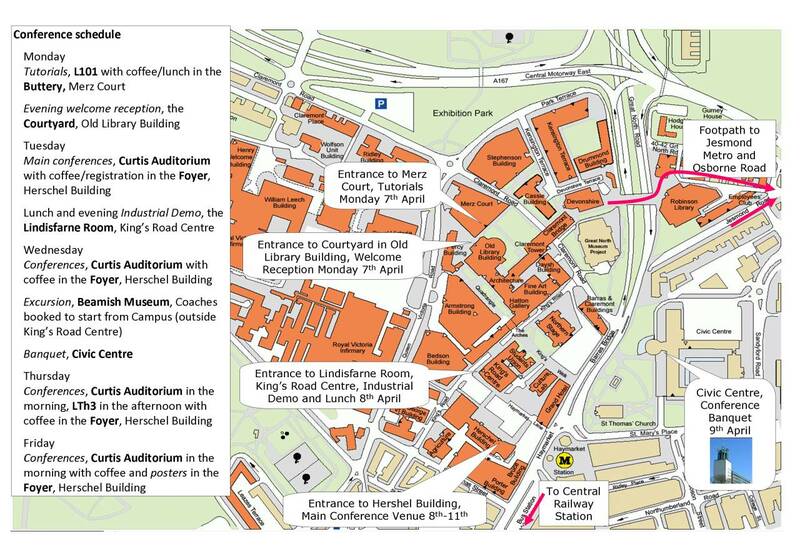 Async and NoCS main conference (Tuesday 8th - Fri 11th April) will be held in the Herschel Building. The Industrial Demos and Reception (Tuesday 8th April) will be held in the Lindisfarne Room in the Kings Road Centre. NoCS 2008, Newcastle University, UK.